Designer Reutter Porzellan of Germany. Reutter makes the highest finequality dollhouse products with realism details, each piece is a little gem. Doll House Coffee Grinder. Dollhouse Miniatures. Miniature Fine Porcelain. Reutter Porzellan of Germany has an established reputation for creating high quality elegant miniatures, well-crafted and beautiful to behold. 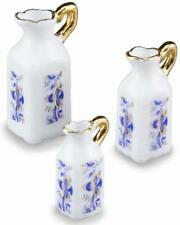 Reutter Porzellan has been creating miniature porcelain since the early 1950's. Reutter Porzellan. REUTTER TEA SET. Germany Dollhouse Miniatures. For Baby Nursery. Peter Rabbit Porcelain Tea Set. the tea set is still attached to the cardboard display. Reutter Porzellan of Germany has an established reputation for creating high quality elegant dollhouse miniatures, well-crafted and beautiful to behold. 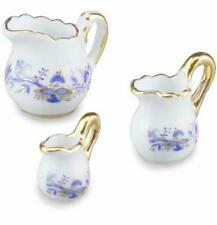 Reutter Porzellan has been creating miniature porcelain since the early 1950's. Blue floral pattern and trim on white background. 1:12 Scale. This is sized for a dollhouse. Handle adds 1/8". Used for display. Detailed scale model for adult collectors. Not intended for children under 14. A REUTTER PORCELAIN. DOLLHOUSE ADULT MINIATURE. FRUIT: PEARS, APPLES, CHERRIES. SCALE BELIEVED TO BE 1:12 ~. WRAPPED IN INDUSTRIAL SMALL. @ 1 3/8" DEPTH ~. 2 1/8" HEIGHT, @ 1 5/8" WIDTH. & A SERVIETTE OR NAPKIN WITH. A REUTTER PORCELAIN. CAKE STAND, SLICE ON A PLATE. DOLLHOUSE ADULT MINIATURE. SCALE BELIEVED TO BE 1:12 ~. GOLD RING ~. WRAPPED IN INDUSTRIAL SMALL. NOTE THE ORIGINAL BOX ~. Reading Candle & Book Set Reutter Porzellan collectible miniatures are the perfect addition to your dollhouse, miniature scene or classic setting. This product is a 1:12 scale miniature and not intended for children under 14 years of age. Complete Cellar/Kitchen Rack Display Item sold complete as shown! Accessories are permanently affixed to furniture piece. Reutter Porzellan quality collectible miniatures are the perfect addition to any dollhouse, miniature scene or classic setting. Porcelain Candlesticks (2pc) Reutter Porzellan collectible miniatures are the perfect addition to any dollhouse, miniature scene or classic setting. This product is a 1:12 scale miniature and not intended for children under 14 years of age. Contents are non-removable. Our quality Reutter Porzellan collectible miniatures are the perfect addition to your dollhouse, miniature scene or classic setting. This product is a scale miniature and not intended for children under 14 years of age. Upholstered Arm Chair Our quality Reutter Porzellan collectible miniatures are the perfect addition to your dollhouse, miniature scene or classic setting. This product is a scale miniature and not intended for children under 14 years of age. White Fabric Sofa w/Pillows Our quality Reutter Porzellan collectible miniatures are the perfect addition to your dollhouse, miniature scene or classic setting. This product is a scale miniature and not intended for children under 14 years of age. Reutter Porzellan collectible miniatures are the perfect addition to your dollhouse, miniature scene or. Cleaning Bucket Set. classic setting. This product is a 1:12 scale miniature and not intended for children under 14 years of age. Our coffee pot set is hand-embellished in real gold and made from fine porcelain. Sugar dish & coffee pot have non-removeable lids. Our quality Reutter Porzellan collectible miniatures are the perfect addition to your dollhouse, miniature scene or classic setting. 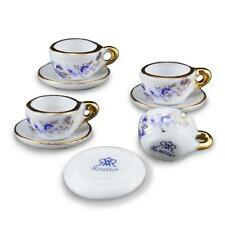 1:12 Scale- Reutter Porcelain- Made in Germany- Boxed Set. Manufacturer: Reutter Porzellan. Type Dish Set. Scale 12th. Rest of World. Parental supervision is strongly advised. Characteristics Set. Our English Rose dinner set is hand-embellished in real gold and made from fine porcelain. High detail from our original decals make the fired product unmistakably Reutter! 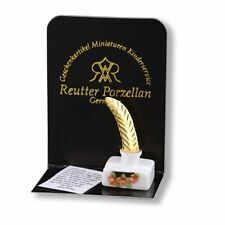 Our quality Reutter Porzellan collectible miniatures are the perfect addition to your dollhouse, miniature scene or classic setting. Reutter Porcelain. 1:12 SCALE INK WELL SET. 1:12 Scale- Reutter Porcelain- Made in Germany- Boxed Set. Manufacturer: Reutter Porzellan. Type Coffee Service. Rest of World. Parental supervision is strongly advised. Characteristics Set. Type Tea Set. Rest of World. Parental supervision is strongly advised. 1:12 Scale- Reutter Porcelain- Made in Germany- Boxed Set. Manufacturer: Reutter Porzellan. Item Information. 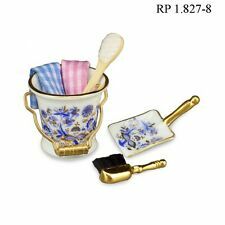 This coffee set set is hand-embellished in real gold and made from fine porcelain. Decal printing is the highest quality and makes for perfect detail when fired. Sugar dish & coffee pot have non-removeable lids. 1:12 Scale- Reutter Porcelain- Made in Germany- Boxed Set. Manufacturer: Reutter Porzellan. Rest of World. Type Tea Set. Parental supervision is strongly advised. Characteristics Set.